F4/80hi kidney macrophages are minimally replaced by precursors from the blood after IR-AKI. (A) Schematic representation of AKI in parabiosis model. 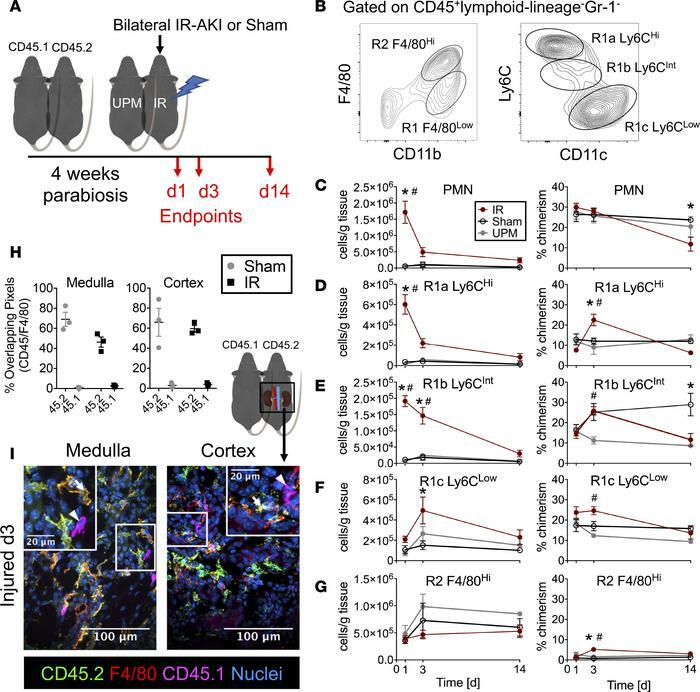 One animal in a pair of CD45 congenic parabiotic chimeras underwent bilateral ischemia/reperfusion AKI (IR-AKI), and tissues were studied at 1, 3, and 14 days after injury. IR, injured; UPM, uninjured pair member. (B) Gating strategy and naming convention for kidney mononuclear phagocytes (MPs), including R2 kidney-resident macrophages (KRMs) and R1-infiltrative MPs. (C–G) Total absolute numbers (cells/g tissue) and percentage of chimerism for kidney (C) neutrophils (PMN), (D) R1a Ly6Chi, (E) R1b Ly6CInt, (F) R1c Ly6Clo, and (G) R2 F4/80hi MPs after IR-AKI at days 1, 3, and 14. Mean ± SEM, n = 4–7 (≥4 pairs), 2-way ANOVA with Tukey’s post-test, *P < 0.05 for IR vs. Sham, #P < 0.05 for IR vs. UPM. (H) Mander’s overlap coefficients (percentage overlapping pixels) were plotted for CD45 allotypes overlapping with F4/80+ pixels. (I) Representative colocalization of CD45 allotypes with F4/80+ kidney MPs by confocal microscopy of transverse sections from injured kidneys in the medullae and cortices. Macrophages expressing CD45.2 (arrow) or CD45.1 (arrowheads) are indicated. Scale bar: 100 μm; 20 μm (insets). Representative of 3 biologic replicates per treatment group from 2 independent experiments.